Need Help Writing Emotions? The Emotion Thesaurus Second Edition Is Here! Today’s an exciting day because I’ve been helping Angela Ackerman and Becca Puglisi at Writers Helping Writers keep a big secret, and now I finally get to share! If you don’t know Angela and Becca, I hope you recognize the name of their most famous book: The Emotion Thesaurus. Avoid naming emotions by instead showing what the emotion looks like, helping readers connect to our characters. Avoid head-hopping by revealing the emotions of our non-point-of-view characters through physical cues, even hinting at their lies. Avoid flat, unemotional writing by giving us options for layering in multiple responses with stronger emotions. So, what does all that have to do with Angela and Becca’s “big” secret? I’m now able to announce what the next book in their thesaurus series will be! Introducing The Emotion Thesaurus Second Edition! Whether you’ve heard of the original Emotion Thesaurus (or have a copy) or not, it’s been seven years since its release in 2012. Thanks to its awesomeness, it quickly became the go-to guide on expressing character emotion. The book’s lists of body language, thoughts, and visceral sensations for 75 emotions made brainstorming character expressions and reactions so much easier. However, just like the rest of us, Angela and Becca’s knowledge grew over the years. They thought of new responses, new entries, and new writing tips they wanted to include. So they decided to revisit the already amazing original book to see how they could make it better. 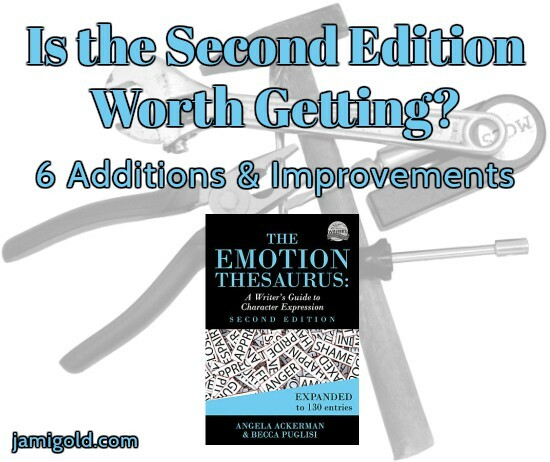 6 Ways The Emotion Thesaurus Second Edition Is New and Improved! Like many writers, I have the original ET, so that of course prompts the question: If I have the first edition already, do I need the second edition? There are tons of words for emotions in the world, so with “only” those 75 entries, they obviously weren’t listing every emotion we might need to reference in the original edition. While we could often find a close emotion, sometimes we couldn’t. In this second edition, Angela and Becca have added 55 entries, bringing the total to 130 emotions. Find the full list of included emotions here. The new entries include several emotions that aren’t anywhere close to the previous ones, giving us new paths to explore for our characters and their responses. In addition to those 55 additions, they also updated the previous entries with clearer descriptions and cues. More importantly, they added new sections to all 130 entries. 6 ways The Emotion Thesaurus *Second* Edition is new and improved... Click To TweetThe first edition included suggestions for “May Escalate To” emotions for each entry. For example, they pointed out that Anger may escalate to Rage, so if the details for one emotion didn’t quite fit our character or situation, we could check the related entries. 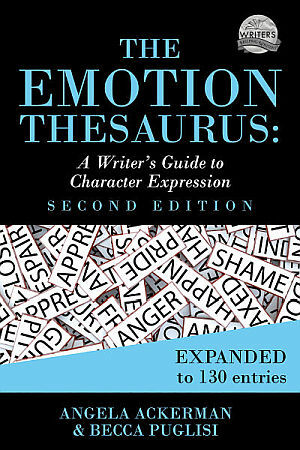 With the second edition, they added “May De-Escalate To” for every entry, including the original 75 emotions. For example, Anger may de-escalate to Frustration. Plus, all 130 entries now have suggestions for Associated Power Verbs. The power verb suggestions might help us with our word choice when trying to include our showing descriptions for our character’s emotions. For example, Anger‘s suggestions include: blaze, flare, redden, seethe, tremble, etc. One thing Angela and Becca have done with their later Thesaurus books is include a lot of writing advice and tools in addition to the thesaurus entries. The original ET, being their first book, was a bit lighter in that regard than their later books. The new section “Character Research: What to Know to Write Authentic Emotion” gives us a solid foundation on understanding our character well enough to know how they express emotion different from all other characters. Are they demonstrative or reserved? What are their emotional comfort zones? How is their response to stimulus unique among characters? What are their emotional sensitivities and insecurities? The new section “Using Dialogue to Write Emotion” helps us understand how a character’s emotions can affect their dialogue. How would a timid character speak differently in a confrontation than a confident character? How do body language and vocal cues add to the power of the dialogue? How do a character’s immediate goals affect their dialogue? The new section “Subtext: What Lies Beneath” shares tips on how to include subtext to hint at emotion. This is especially important when we need to show that a character thinks or feels the opposite of what they say. Even with all those 130 entries, we might still feel like we fall back on the tried-and-true descriptions too many times. The new section “Additional Ideas for Brainstorming Fresh Emotion” lists several ideas for how we can gain new perspectives on emotions. Great! How Do We Get a Copy? There you go, all the information I can think of to help you decide whether you should grab the second edition. Let me know in the comments if you have any questions about the second edition or these new sections or improvements. And… Until the end of February, Angela and Becca are giving away a free webinar recording of one of their popular workshops on emotion: Using Emotion to Wow Readers. So head over to their official announcement and check out the webinar link if this is an area of struggle for you. Do you struggle showing your characters’ emotions? Or did the first edition of the ET help you already? Are you thinking of grabbing the second edition? Or do you have questions before you make your decision? What do you think of their announcement—are you excited for this release? What Are Your Favorite Writing-Related Resources? This is one of the best writer’s aids I’ve ever used. It’s one of the few books I refer to every time I write or edit. Jami, this is terrific how you have outlined all the areas that are new so people know exactly what they would find in the second edition that isn’t in the first! Thanks so much for this breakdown, Jami. What a wonderful way to highlight our new book. I’m so glad you found the changes helpful! I have the first edition on my desk and use it often – well-thumbed. I’ve ordered the Second Edition (and done a blog post) and I’m excited after reading your review, Jami. Angela and Becca have added everything I need and so much more. Roll on February 19th. This is a terrific book. I use it and the others in writing. Glad to see a 2nd Edition!!! The Emotion Thesaurus is my favorite reference — I use it more than any other writing book on my shelf. Thank you so much, Jami, for giving us an overview of what’s been updated/added. I’m definitely going to order this new edition!